@hendocfc what are the biggest changes on Nashville's jersey? I know they can use their alternate at the draft, but could the Wild be making a switch to the green unis for the home set? Have they used the green at the draft before? 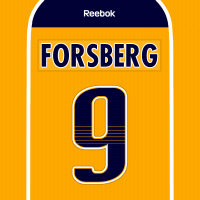 Flip the colors of the away jersey's yoke to balance the colors a little bit more and I agree with the above comment, the checkerboard pattern has no real connection to Nashville and is hardly noticeable, solid concept otherwise. As much as I liked the old set, these are an upgrade. The logo is great, the collar is really cool because it looks like the state flag, the captain's patch on the sleeves is also a nice touch, it is much better than I expected, and it is a really nice upgrade, even with a lack of a lot of blue.